But of course I do tend to have 3-4 nights a week where I get no sleep. Like none whatsoever unless I take a xanax or over the counter sleeping pill. On the nights that I don't get sleep it's usually because I'm super stressed, I'm sore from working out, or my medication keeps me super antsy. Because of this I make sure that I've got everything I need to combat restlessness at the drop of a hat. Here five things that I always make sure are done and/or super close to me to ensure that I try to get the best sleep possible. While I start to shut down for the night I turn this lamp on and try to make it the only light in my sleep area. 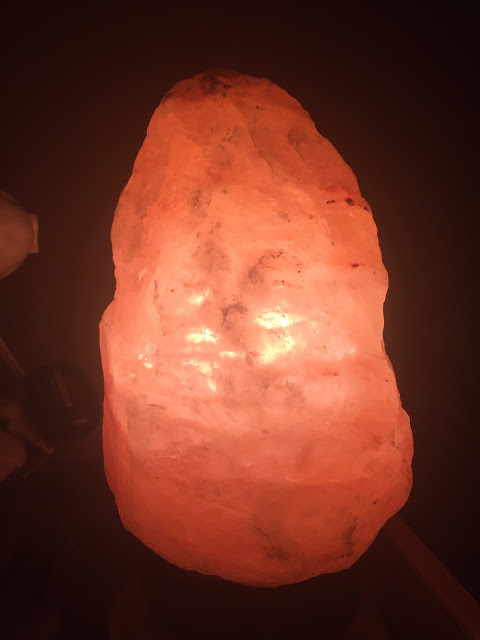 Salt lamps have a ton of benefits that you can read about in this post, so having one near by bed is essential! I love that I can have this bright enough to get minor things together before going to bed, and even read a magazine while I'm unwinding, but then dim enough where I can keep it on at night for all of its benefits without making it hard to sleep. I keep mine right next to my bed, alongside my rose quartz stone, and I swear it does wonders for helping me get relaxed before bed. Because my family and closest friends are all on the east coast I always had my phone on in case someone had a faux emergency that they needed to text me about. This isn't something I minded so much on a regular basis but it was tough on those days that I finally went to bed like an hour before the messages started. Because of this I started putting my phone on airplane mode so that I wouldn't get distracted by the messages and I was also preventing those pesky little WiFi rays from getting to me! I started wearing these two years ago when I was really stressed out about a move. I was physically exhausted at the time but my brain wouldn't shut off. I never had proper curtains in the apartment that I was living in and sometimes if the building across from me was dealing with a lot on construction there would still be lights on even after dark. Once I started using an eye mask I committed to it. When I wear it I don't take it off unless I'm getting up to use the restroom or need to get some water. In the past I've gotten up in the middle of the night and immediately got on my phone. This not only gave me some negative energy (from the WiFi and the light) but also restarted my brain, making it hard to get back to sleep. With my eye mask rule in place I never get distracted in the middle of the night by my phone because I can't see it. The eye masks that I use are all from Virgin Atlantic, Air France or Air Berlin. There's something awesome about taking international red eye flights and that something is their travel kits that they give out even if you're only flying coach! Because of all the stress that I keep experiencing on and off I'm starting doing things that I've never done before. Most of these involuntarily. One such thing is grinding my teeth at night. I spend hundreds of dollars on Invisalign, as well as almost two years with aligners in, so it's really important that I do not mess up my teeth. Plus, whenever I grind my teeth I wake up with awful headaches. This didn't happen every night but when it did it was awful and annoying. 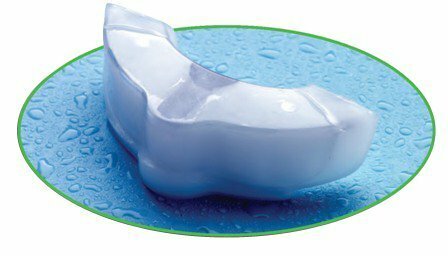 I've been using this GrindReliefN Grind Guard for the last few weeks and I haven't been waking up with headaches anymore from grinding my teeth. Both my doctor and dentist told me that my headaches were caused by involuntary grinding due to stress while I slept so having this was a must for me. Of course they're normally super expensive so being able to get these was awesome. I was able to fit these really easy the way most grinders get fitted. I put these in hot water to heat them up, put them in my mouth to fit, and then rinsed them in cold water for a about a minute after and then fit them again. I did this by following the instructions as well as by looking up reviews online. Grind Guard gave me a $10 off coupon that my readers can use to get this on Amazon: SBDCHYYT. Just make sure you purchase it from My Quest Store in order for it to work. Staying in tune with the idea of finding natural ways to relax my mind, I've been using essential oils a lot in my every day life. I use it clean (hello tea tree oil! ), to relax my mind throughout the day and before bed (lavender and rose oils) and then after my shower. Before going to bed every night I put my diffuser in the bathroom and take a long warm shower. This Sleep & Relaxation Oil is super calming and that, mixed with the warm water, helps me relax mentally and physically--or at least that's what the plan is! I always make sure to take super deep breaths when I'm doing that because it makes me focus on why I'm doing what I'm doing and kinda gives me that extra relaxing push. Then I follow that up by putting some Sleep & Relaxation Oil in the diffuser next to my bed to really let things set. The lavender in this oil really does the trick and so far I feel like my sleep has been much better. This may all sound like hippie methods to getting a good nights rest and I can always go back to taking prescription or over the counter medication to get immediately shut eye but I'm trying to move away from that. Aside from not being able to travel with my salt lamp, all of the other methods that I've been using to try to get a decent nights rest can be done anywhere and I think that if I continue to stick with it I'll have more restful nights than not.